ESSA Update: preliminary decisions, transition year and more. Thank you to everyone who joined us on Tuesday, April 18. We had a great turnout to discuss the preliminary decisions that have been made in drafting our ESSA state plan. The commissioner and staff from the Minnesota Department of Education gave a brief overview of what decisions have preliminary been made, and how those decisions came to be. The audience then posed questions to the commissioner about the decisions and other parts of the state plan. For more information, please visit the ESSA web page or email mde.essa@state.mn.us. The next ESSA Update meeting will be Thursday, June 15 at 5:30 p.m. in Roseville. Details coming soon! 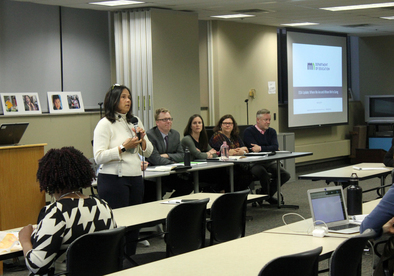 Staff from the Minnesota Department of Education were invited to discuss changes under ESSA with teachers and school leaders from the Metropolitan Education for Future Employment (MEFE) charter school in Minneapolis’ Whittier neighborhood. Department staff presented basic information on ESSA and listened to the experience of educators and school administrators. MEFE staff and community members gave feedback on the challenges and opportunities they saw with their students. MEFE draws students from 17 countries, including Southern and Eastern Africa and Syria. MEFE leaders explained that they administer a GED readiness test as a pre-assessment for proficiency and graduation readiness. MEFE participants described the difficulty they had in obtaining formal records for their students with limited formal education, or with coursework only from international educational institutions. Primarily oral cultures may rely on multiple levels of interpretation to relay information. Educators noted some assessments such as the ACT and Accuplacer were not culturally sensitive, and yielded results that may be invalid for MEFE students with their wider range of life experiences. MEFE staff describe reports from students who graduate and are put into college EL tracks, who then expend funding on remedial coursework. They report there can be a real gap in academic English proficiency. MEFE staff noted that adolescents have a social and emotional reaction to being placed in EL services, and may react to the perceived stigmatization by resisting placement. They describe that students reach a level of social English and don’t want to be seen as ‘stupid.’ Similarly, students and families were described as sometimes resistant to participating in special education services because of their experience with stigmatization. MEFE staff observed that environments such as theirs, which are more ethnically focused, are nurturing and supportive of the soft skills students need to succeed. Department staff had a chance to present on ESSA to community members from the Lao Advancement Organization of America (LAOA) at a community lunch. Program participants then provided feedback and asked questions. Members were primarily Laotian-born seniors with family members in schools throughout the metro area. Community members expressed a desire for more Lao-language interpretation services. They described that non-English speaking elders provide child care for school-age children. Participants stated that working parents are often very busy, and grandparents are a key group for schools to engage. Community members also described that many of their families arrive in the US with limited formal education, and need support to engage the U.S. educational system. They describe that families are not aware of what opportunities to expect from schools. LAOA staff observed community members may not value the formal education system because of life experience in their home countries. To keep everyone updated on the status of our draft state plan, we have created a document on preliminary decisions that have been made as of April 2017, as well as a transition document outlining what to anticipate in school accountability, reporting and recognition over the next year. For questions related to this information or any other parts of ESSA, please contact mde.essa@state.mn.us.